Melvin MOTI (1977, Netherlands) is a Rotterdam-based photographer and video artist. Moti studied Visual Arts in Tilburg and worked at De Ateliers in Amsterdam. In 2006 he was awarded the Charlotte Köhler price. Moti's work has been exhibited in Berlin, Tokyo, Boston and Brussels. In the Netherlands his work has been shown at the Stedelijk Museum Amsterdam and Witte de With in Rotterdam. 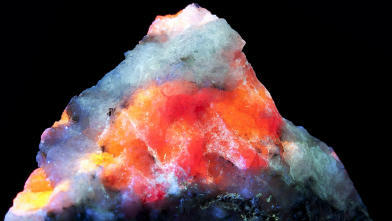 Certain minerals convert absorbed UV light into visible colours of unearthly beauty. Shown in sacred, cosmic silence. In the dance film Top Legs which Moti conceived in Kingston, Jamaica, an elderly woman tells stories about her days as a dancer. From her supple movements, one can tell she has not lost her skills. In Moti’s filmic works, image and sound are united in carefully constructed settings in which he renders visible the thin line between past and present.